Plainview, Texas—The Aggies wrapped up a rough road stretch on Tuesday evening, as they took on two nationally-ranked basketball teams at Wayland Baptist University. The Panhandle State women's team fell 75-65 to the No. 6 Flying Queens, while the men's team was defeated 82-76 by the No. 14 Pioneers. Both WBU teams currently top the SAC charts at No. 1 in the conference. The Aggie women outscored their opponents 13-11 in the first period of play, but the Queens came back with a huge 27-point period in the second to claim a 38-30 advantage at the break. Panhandle State stayed consistent in the second half, but were unable to overcome the first half deficit. Addison Munsch held the game-high in scoring with 23 points, and also led the team in rebounds with eight. Taylor Acosta and Naomi Rodriguez combined for 20 points, scoring 11 and nine respectively. Nadia Hayes and Hannah Faulks assisted at the boards with six rebounds apiece in the game. WBU won the turnover margin by ten as the Aggies gave up 20 points on 25 turnovers. At the boards, Panhandle State players were outmatched 52-39, allowing 15 second-chance points to the Queens. The Aggies now hold an 8-7 record on the season and stand No. 7 in the Sooner Athletic Conference with a 4-5 record within the league. Panhandle's men made a valiant second-half comeback effort, scoring 41 points in the final 20 minutes of play and shooting over 51 percent after halftime. The team was led by Breiman Alexander, who hauled in his second-best scoring performance of the year with a game-high of 33 points. Starters accounted for all 76 of the team's total points including Alexander, Jaedon Whitfield (15), Alan Hodge, Jr. (12), Khallid Edwards (10) and Baris Ulker (6). Each team averaged 46 percent in shooting from the field, but the Pioneers dominated at the boards, out-rebounding the Aggies 44-24 and claiming 17 points in second-chance shots. WBU's bench added 34 points for the Pioneers, led by Tre Filmore who posted a team-high of 24 points. The Aggie men also sit 8—7 for the season and are currently tied for the seventh slot in the SAC standings with a 3-6 conference record. Aggie Basketball returns to Anchor D Arena this week with two Sooner Athletic Conference contests on Jan. 17 and Jan. 19. 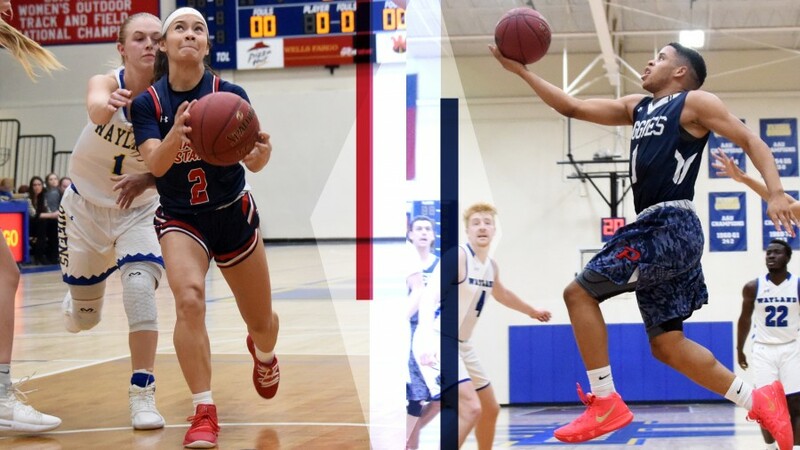 Thursday the teams take on John Brown University, with the women tipping off at 6 p.m. and the men following at 8 against a No. 24 nationally-ranked Golden Eagles group. On Saturday, Panhandle State meets with the Warriors of Bacone College at 2 and 4 p.m. Each game offers live stats and video streaming online at opsuaggies.com.